Summary The PV power plant is mounted on dormers in the roof of the historically listed city-hall at Freiburg. This project shows, how PV systems can be integrated in historical urban areas. The local utility badenova GmbH is acting as a contractor of the plant. 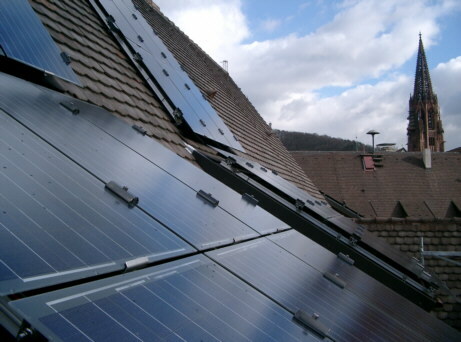 In total the 165 panels represent a peak power of 16,8 kWp. The annual electric output is equivalent to 2 % of the annual electric consumption of the building.